Knights of Creativity Spirit & Ale: Feeling Blue? Perhaps there is one benefit of global warming (real or not) that we can all drink to: As the ice caps melt, the Japanese get to enjoy really good beer (good is relative). From the great North of Japan, Hokkaido, comes Okhotsk Blue, from Abashiri Brewery. From what I'm reading,The Okhotsk Blue Draft is not just beer with food coloring; it's one of the most unique beers around. Chief among its odd sources is water from melted icebergs that float to the Hokkaido beaches from the Sea of Okhotsk, an area in the Pacific Ocean near both Japan and Russia. 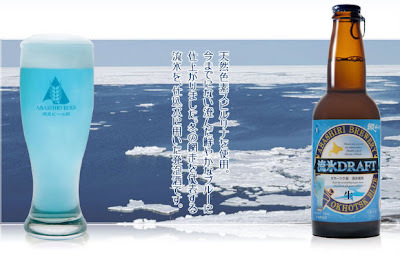 The Abashiri Brewery achieved the attractive hue by adding blue seaweed into the mix. And, Abashiri didn't' stop at blue. 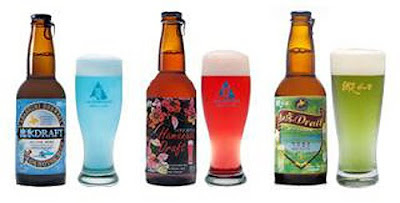 Some of their most popular beers include RED Hamanasu Draft, GREEN Shiretoko Draft and PURPLE Jyaga Draft (The concept for this line revolves around the four seasons and the Okhotsk Sea, an icy arm of the North Pacific Ocean bordered by Japan and Russia). According to one on-line source: The line of rainbow brews are not Abashiri's first wacky beer endeavor, however. 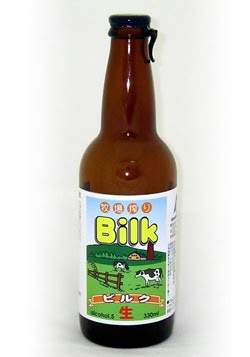 The brewery made headlines in 2007 with its somewhat less appealing (but nonetheless intriguing) Bilk, a malt beverage made from 70% beer and 30% milk. The idea came about after declining milk consumption in Japan left a surplus of milk. To avoid wasting it, liquor store owner Chitoshi Nakahara proposed Bilk as a solution. Unfortunately Abashiri no longer produces Bilk (perhaps it succeeded in eliminating the surplus...or inducing projectile vomit), but you can purchase the multicolored beers on the company's Web site. green beer that is Japanese? we are becoming a melting pot in this big wide world! here I was planning on only drinking green beer tomorrow - oh the opportunities! I'm with Sir D, preferring good ole' Brown Beer! However, for us history buffs in response to Bilk...the Mongol's conquered much of the then known world fueled on fermented goats milk! Sir Hook the Gengis of Warrick...Got Milk?! Oh, no! Another food site for Sir Bowie! LOL! Actually looks interesting, thanks! As far as the Brits and the French, we all know that the Brits could beat the French drinking anything!